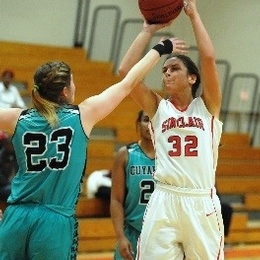 The Athletic Department is pleased to announce that Women's Basketball Forward Madison Schroeder (Dayton Carroll H.S.) has received the Buckeye Charters Student-Athlete of Distinction Award for the month of December, 2015. Each month the Athletic Department in conjunction with Buckeye Charters, selects a student-athlete who has been a leader in Community Service, Classroom and Competition – also known as the 3 C's. Sophomore Madison Schroeder of the Women's Basketball team has been very active with the team with visits to the Dayton VA, serving Thanksgiving Dinner at a local church and volunteering at a local block party for community engagement. She has continued to lead the way in the classroom earning over 3.0 GPA Fall semester and is on pace to earn Academic All-Conference honors. Madison leads the team in scoring with 15.5 points per game and ranks second on the team with 8.4 rebounds per game. Special thanks go out to Buckeye Charters for helping establish this monthly award that honors those student-athletes that are great in the three C's. Buckeye Charters has been providing quality and reliable transportation for student-athletes around the region as well as many other groups for over 22 years.